This post will probably only relate to people who have already been down here. 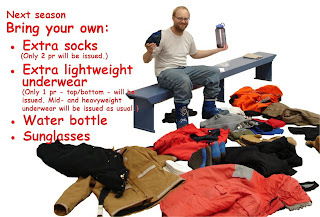 Next year, the United States Antarctic Program will no longer be giving out as much gear as they have in the past. I assume this has to do with budget cuts, but that is speculation. I'm not sure how I really feel about it. Having been down here, I know that you don't use most of the stuff they give you. Lots of people prefer their own gear or their job simply doesn't require as much as they give you. When I was packing for the first time, I really had no idea what to expect. Knowing that they would provide for me certainly eased my state of mind. On the list above, I use their socks regularly, but only if I am wearing my sandals. I used their sunglasses in the summer and their water bottles after my own disappeared. Of course, that is three out of four items. Who knows. I just wanted to give a heads up to my friends who are coming back down.